Hesperoyucca whipplei, or "Our Lords Candle", is native to the Southwestern Desert Regions and can be found from Utah to Northern Baja. You will see it growing on slopes and hillsides all over San Diego County. A spectacularly visible stalk topped by large white and purple bell-shaped flowers that grow from the center of the leaf formation below give rise to the name Our Lord's Candle. The leaves are thin, concave, blade like structures that form a rosette at the base. They bloom in Spring and continue until late April, setting the flowers in pouch like cases for seed generation. This plant is very drought tolerant, needing no supplemental water after establishment. Many parts of the plant were used by native people including the flowers, stalk, stem and seeds. Please be sustainable and do not wild harvest! 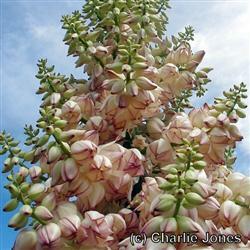 Our Lord's Candle is pollinated by the California Yucca moth and is host to the larvae of this symbiotic partner.